KEEP YOUR TEETH CLEAN WHILE LIVING GREEN! 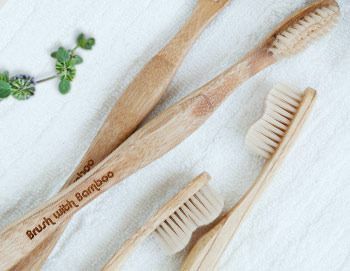 This Bamboo Toothbrush is USDA Certified Biobased Product. This truly sustainable toothbrush handle has a natural feel in your hand & mouth and is made from the fastest growing plant on earth; bamboo! As there is no available plant-based option that would allow you to use your toothbrush for 2-4 months, the BPA-Free bristles are made from recyclable nylon. The toothbrush also comes in a compostable wrapper & biodegradeable box! Plus, when you are done with the toothbrush, you can toss it in the compost bin, turn into garden signs or use to clean the sink. I love my bamboo toothbrush! It's very gentle on the teeth and is not harsh or abrasive! Its very soft and gentle!